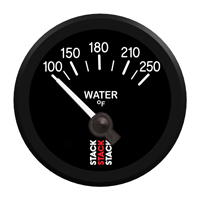 Stack's Electric Gauges bring their renowned quality, simple, easy to read look, and a competitive price to compact and rugged 52mm gauges. Now you can fit Stack instrumentation into industry standard gauge pods for easy install. These low-priced electrical auxiliary instruments feature advanced 90° air-core movements and simple 3-wire installation. Electrical sensors keep hazardous fluids in the engine compartment. White LED backlighting and illuminated needle ensure excellent readability day or night. Electronic gauges stop fluids from entering the passenger compartment. From Anonymous of Calgary, Alberta on 9/1/2013 .